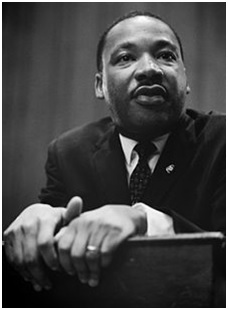 You are here: Home » Celebrating a Civil Rights Icon: Dr. Martin Luther King, Jr. Celebrating a Civil Rights Icon: Dr. Martin Luther King, Jr.
Today is Martin Luther King, Jr.’s birthday, and has become a celebration of one of this nation’s most influential public figures. Of course most people recognize King from his “I have a dream” speech, but not everyone knows the details of how this holiday came about. About 15 years after King’s assassination in 1968, President Ronald Reagan signed the holiday into law in 1983 and began observing it in 1986. The idea of making Dr. King’s birthday a holiday was promoted by labor unions in contract negotiations. Before Dr. King, only two other people had national holidays in the United States honoring them: George Washington and Christopher Columbus. He was born in Atlanta, Georgia as Michael King Jr.
King’s father changed both his own name as well as his son’s name from Michael to Martin Luther in 1934, during a trip to Nazi Germany. This was inspired by German reformer, Martin Luther. He changed the course of U.S. History in helping Americans understand and appreciate that the rights of all people are equally protected by the law. His primary focus was aimed at achieving change through non-violent protests. His awards include but are not limited to: a Nobel Peace Prize, Time’s Person of the Year, a Presidential Medal of Freedom, a Congressional Gold Medal, and a Grammy Award for Best Spoken Word Album. Dr. Martin Luther King served as an inspiration for an entire nation. What or who inspires you? Take a moment to think about this today, and enjoy the holiday!